When you really want to make a statement, order one of our top party items, our Flashing LED Sunglasses! These fabulous flashing sunglasses feature clear frames with LED lights in blue, green, and red inside that can be set to one of three modes—blink, all on, or flash in a red, green, and blue pattern—via the 3 position switch on the frames. A great party favor for any occasion, these light up flashing sunglasses are also perfect for dances, Halloween costumes, and nighttime vending. 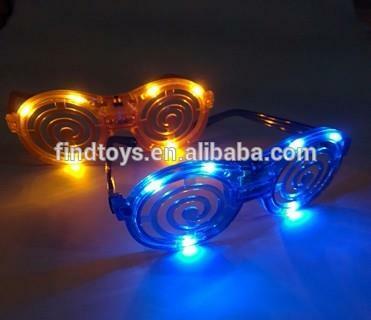 Should you're interested in it, welcome to buy or wholesale the halloween led lighted eye glasses from our factory. We are one of the leading such manufacturers and suppliers in Yiwu, China. We can assure of the high quality and excellent design of our products made in China.